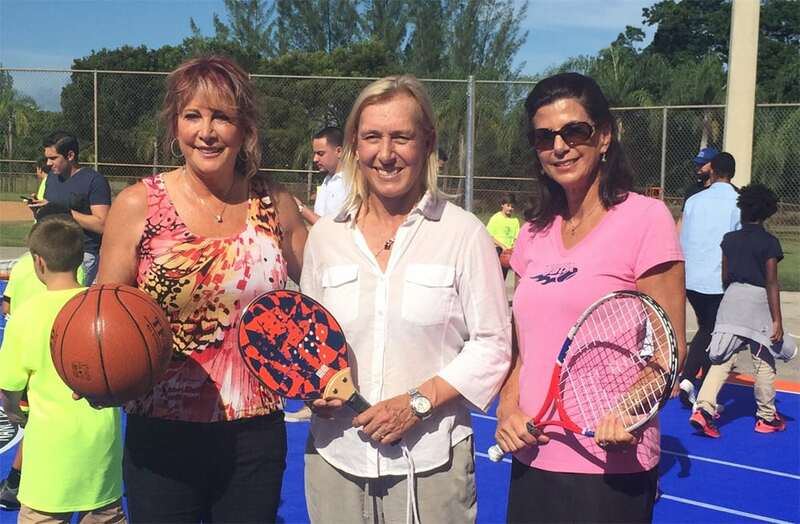 The Miami Boys & Girls Club’s Miami-Dade Kendall Unit last week received a “Dream Court,” a 48 X 80 foot multi-purpose court for tennis, basketball, volleyball and other sports, donated by Basketball Hall-of-Famer Nancy Lieberman in tribute to her friend and Tennis Hall-of-Famer Martina Navratilova. Dream Courts are multipurpose play spaces with the goal of providing children in underserved communities a safe area to play, interact socially, and learn important lessons about teamwork and good sportsmanship. The Kendall Unit Dream Court is the 31st court installed to date at Boys & Girls Clubs and community parks across the country. The court was built by CourtBuilders Sport Court Florida, in partnership with WorldVentures Foundation and a contribution from the United States Tennis Association national body. Lieberman, also a two-time Olympian and NBA Sacramento Kings assistant coach, established Nancy Lieberman Charities in 2009 with the mission to provide a healthy physical, emotional and mental environment for young girls and boys to build self-esteem and confidence to make the right choices. Following the ribbon-cutting, accompanied by members of the Boys & Girls Clubs Miami-Dade, Lieberman officially opened the court with her signature basketball half-court backwards shot, then picked up a racquet and rallied a few tennis balls with Navratilova before the kids took over the court. To learn more about Nancy Lieberman Charities go to www.nancyliebermancharities.org. American teams won three of the eight titles at the 36th International Tennis Federation (ITF) Super-Seniors World Team Championships, held Sept. 12-18, 2016 in Umag, Croatia. 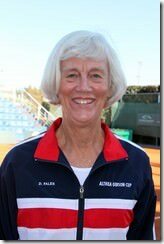 Florida’s Donna Fales (Coral Gables) was on the U.S. Queen’s Cup team (Women’s 75 & Over) that beat France 3-0 in the final, and Gordon Hames (Naples) and King Von Nostrand (Vero Beach) were on the U.S. Gardnar Mulloy Cup team (Men’s 80 & Over) that defeated Australia 2-1 in the final. The U.S. Doris Hart Cup (Women’s 80 & Over) was also victorious, defeating Great Britain 2-1 in the final. It was the seventh consecutive Queen’s Cup (Women’s 75 & Over) won by the U.S., the second consecutive Doris Hart Cup (Women’s 80 & Over) win, and the fifth Gardnar Mulloy Cup (Men’s 80 & Over) over the last six years. Following the ITF Super Seniors World Team Championships, the World Individual Championships will be held Sept. 27-Oct. 4, also in Umag. Next year’s ITF Super-Seniors World Team Championships will be held in Orlando, Fla., at the USTA National Campus Oct. 8-13, 2017. To see the full tournament results go to www.usta.com/news. 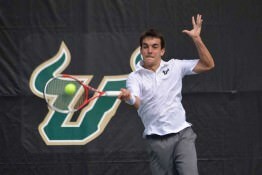 Top-level Division I tennis will be on display this weekend when the University of South Florida hosts the Men’s Bedford Cup. The annual tournament will feature nine of the state’s 11 major universities, beginning Friday morning and running through Sunday, Sept. 25, 2016. For USF Bulls fans, this will be the first chance to see former ATP player and new head coach Ashley Fisher, as well as top recruit Alberto Barroso-Campos in action, and new assistant coach Jimmy Arias. “Our guys have been playing on the professional circuit most of the summer and so have many of the players who will be coming here for the Bedford Cup, so I expect the tennis to be quite solid despite it being our first fall competition,” Fisher said. Participating teams are FSU, USF, Florida, Stetson, UNF, FAU, FGCU, FAMU and Bethune-Cookman. Hosted by a different state university each fall, the Bedford Cup is sponsored by the Youth Tennis Foundation of Florida and is an individual-based tournament exclusive to Division I Florida college players. Florida colleges annually feature many of the country’s top players, and Bedford Cup matches count towards players’ national and regional rankings. USF is also hosting the Women’s Bedford Cup the following weekend. Parking and admission is free throughout the tournaments. For more information go to www.GoUSFBulls.com.